To be completely honest, I first heard of this novel in an interview with Kristen Stewart, where she named it as her favourite book, and not to sound full of my self or anything, but I figured that if she could read it so could I. Well, at this point I have to say fair dues to Kristen because she really picked a winner here. According to my goodreads it took me about four months to read this, but really if I had had enough time to actually read recently, I would have had it finished in a flash. Essentially, I found this was the sort of book I had a lot of trouble putting down once I had started, simply because the story was so riveting. Sometimes Steinbeck goes off on a tangent with minor characters , which I usually hate, but he still managed to keep me interested. 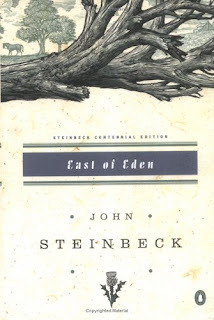 I found the connection between the story of Cain and Abel and Steinbeck's characters really easy to follow, which was good for me because I'm not that familiar with the story and I'm kind of dense when it comes to these sort of things. Also, I was sort of confused when Steinbeck wrote himself into the story, but I read on East of Eden's wikipedia page that Samuel Hamilton is based on his own grandfather, which makes a lot more sense now. I'm sure there was a lot of really deep meaningful ideas that went right over my head, such as the nature of human beings and how they can be inherently evil, and the whole Timshel thing which I think is to do with free will or something. I think this novel was supposed to be really inspiring, but really I was just focusing on the absolutely brilliant plot and characters that Steinbeck created so superbly. I would really recommend reading this if you have the time to invest in it, it's definitely not a light read, but completely worth it.